This entry was posted in Mental Health, Recovery & Support and tagged Co-Occurring Disorder, Managing Symptoms, Overcoming Fear, Treatment on July 26, 2016 by Baxter Ekern. Addiction recovery requires a series of steps of lifestyle renovation that require both dedication and determination. Anxiety, however, can take each or any of the necessary steps of lifestyle change and add onto them an enormous emotional burden. The range of worries that ensues can make one’s progress in recovery seem impossible, regardless of how much a person desires to recover. 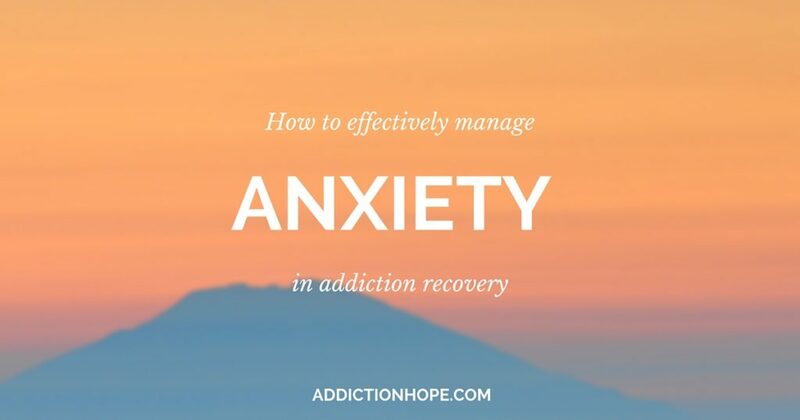 When it comes to developing new anti-anxiety skills, the person in recovery should remember that individuals will not experience a major change immediately, nor will anxiety disappear overnight. Ideally, a person could break each social interaction skill into categories and work on each skill one at a time. After mastering one skill, a person could move on to the next. That sounds logical, but life is not that uncomplicated. Hence, patience is key. The truth is that a person learning to overcome anxiety will have to apply many new skills all at the same time. For example, having a conversation might require learning to stop negative thinking while enduring physical reactions and at the same time trying to listen actively to another person – obviously applying many anxiety management skills all at the same time. Avoiding situations that might cause anxious reactions can actually result in more anxiety. It is much better to take consistent steps to face anxiety that last for increasing increments of time. It is beneficial to start with small fears, like responding either yes or no to that uncomfortable invitation. It is also valuable to schedule practice sessions for the bigger fears, like giving a presentation or participating in an interview. Put some forethought into the possible questions and ask a respected acquaintance to play the other part whenever possible. Remember that many situations that cause social anxiety are very brief. When the situation is over, some self-analysis might be beneficial. Stewing over what should or could have been different, however, is not worth the worry! In fact, facing the situation is of no benefit if you decide to beat yourself with negative thinking afterwards. Focus on the positive. Then, reward yourself with some other activity that includes a diversion of thought and perhaps a little relaxation. Even a friendly phone call or some simple household chores with fun background music could do the trick. Before entering rehabilitation, practical steps should be taken to get one’s life into order to any extent possible. Seek out a support system of family or friends who can help maintain the home or perform small tasks if needed, but beware of letting others handle responsibilities that you are capable of. Thoughts play a huge part in emotions. When you start to feel anxious, force yourself to think about the positive results of recovery so far. Audibly voice the benefits that you appreciate. Habitually expressing positive and appreciative thoughts to others (even if it feels forced at first) trains your mind to feel more positive and have less anxiety. Certain foods actually result in worsened emotional health, so eat a balanced diet. Eat right and exercise: We have all heard it. The value of this really cannot be stressed enough. Heart and brain functioning, as well as breathing, plays a part in the anxiety response systems of the body. Do not underestimate the role that physical health will play on your emotional health. Work on one item at a time. Do not worry about what has already happened. Practice and plan, but do not worry about what might happen. Place your feet on the floor and get moving when you get anxious. Never let anxiety paralyze you. Work on your objectives steadily and slowly, and move from one to the next. Do not try to do every physical task at one time, but do keep making progress. As you work progressively to finish your tasks without giving time in between to worry about what will happen if you do not, you will find yourself making progress, which will result in greater self-security. Share your concerns with your mental health counselor, who understands anxiety and can help you to make continued progress. Good health to you! Want to learn about how to effectively manage depression while recovering from substance abuse? See here. If you or your loved one struggles with anxiety, what types of activities do you do to overcome anxiety? Please share your experience in the comment section. “Effectively Managing Anxiety In Drug Addiction Recovery” was written by Skyway House (Chico, California) clinical team member Kathryn Taylor, MA, LPC/MHSP. A licensed mental health counselor, Kathryn has several years of experience working in dual diagnosis addiction treatment, women’s issues and trauma treatment. : “Understanding the Facts.” Anxiety and Depression Association of America. Retrieved online 11, April 2016 at http://www.adaa.org/understanding-anxiety.